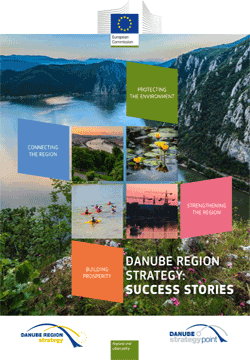 On November 3rd 2016the Danube Region Strategy: Success Stories was launched at the 5th EUSDR Annual Forum, a collection of successful projects, reflecting the achievements of the Strategy during its first 5 years of implementation. Since 2011 the Danube Strategy of the EU provides a framework through which countries and regions along the Danube are working together to better tackle their joint challenges. The brochure herein provides concrete examples of the results of this cooperation. The projects and achievements show the added value of the Danube Strategy through examples of good practices which could also serve as source of inspiration in this and other macro-regional contexts. The brochure reunites these examples under 4 headings, correspondent to the 4 pillars of the Danube Strategy: connecting the region; protecting the environment; building prosperity and strengthening the region. Danube Region Strategy: Success Stories is available in Bosnian, Bulgarian, Croatian, Czech, English, German, Hungarian, Montenegrin, Romanian, Serbian, Slovakian, Slovenian or Ukrainian.